Easter’s round the corner so we’ve picked some of the best places to go over the festive weekend! Here is a list of the best places to dine and have a load of activities during Easter in Singapore. The Kempinski Hotel as two choices for those who want to go big on Easter. The first choice is to celebrate with a grand egg hunt and face painting for the kids at 15 Stamford by Alvin Leung. While the kids are entertained in the designated children’s area at the Egg-ceptional Easter Brunch, parents can dine on the international brunch which includes a cocktail bar and live acoustic performances. face and body painting, balloon sculpting and a friendly Easter Bunny mascot at the dedicated children’s area. 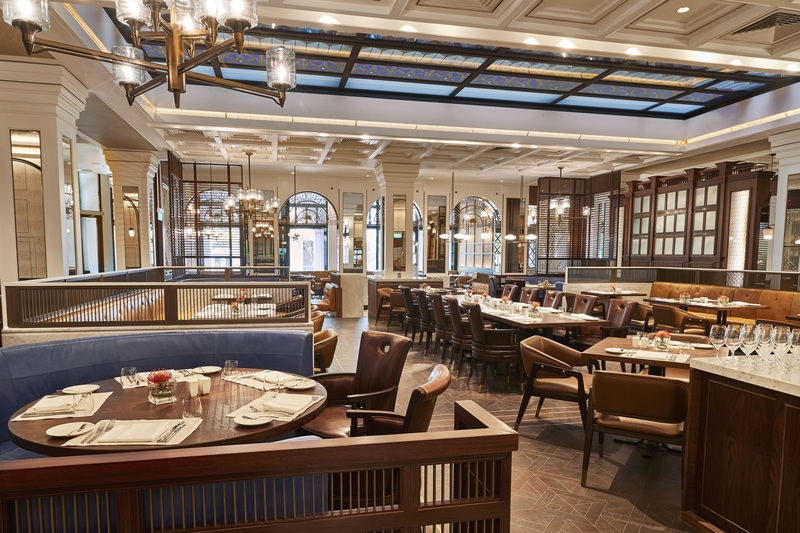 The second option at the Kempinski is to go all out, German style, with wiener schnitzel, pretzel dumplings and Easter rice pudding. The children’s area is the same as 15 Stamford, so you know your kids will be entertained while you dine on your Easter brunch with free-flow German beer or Taittinger champagne. More information and reservations here. There is a deluge of egg-stra special activities happening at the Marina Bay Sands over Easter and the entire month of April. Start with an Easter brunch at lavish Adrift by David Myers ($98++), then head on over to Bread Street Kitchen by Gordon Ramsay with a delicious brunch and a dedicated Kids’ Corner where the little ones can take part in Easter activities like painting eggs or decorating cookies ($79++). 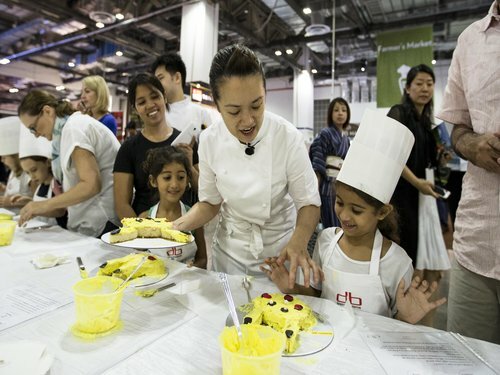 There is a strictly kids only cooking class at db Bistro & Oyster Bar ($120++). Rise is having its annual Easter egg hunt at the herb garden with an Easter brunch (adult: $98++; child: $25++). Black Tap Craft Burgers & Beer is serving more than burgers and booze as they whip up some delectable sweet treats like the Easter-liscious Wild Cherry Shake ($22++). There are even more options to choose from, but whatever you pick, it’s sure to be festive and packed with entertainment. For more information and reservations, see here. Crowne Plaza invites you to an ‘egg-citing egg-venture at Changi Airport’ this Easter. In celebration of the occasion, their buffet treats include a complete Egg Station where you can ask for any eggs you desire. Apart from eggs there is an array of choices from Drunken Prawns in Herbal Soup and Glass Noodles with Crab to Seafood Paella and Shakshuka. Their traditional Easter sweets are not to be missed too. Check out their Classic Easter Carrot Cake, Hot Cross Buns, Warm Chocolate Pudding, and Cake Pops. Kids Funland at Bar ’75 is where it’s at for the little ones where they can enjoy great family movies with delicious snacks from the mini buffet like mini burgers and cake pops. Parents can even join in with the Egg Painting session and Egg Hunt. 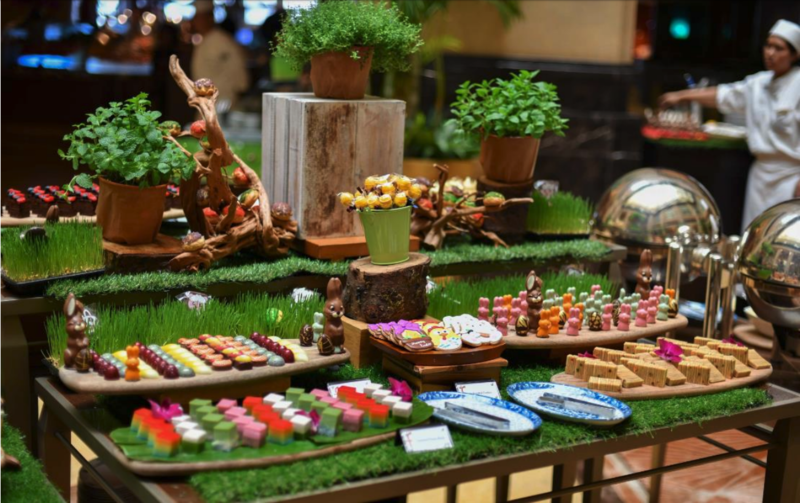 Offering the finest Local Easter treats right in the heart of Orchard Road, Marriott Cafe’s team of culinary maestros will be whipping up a bevy of local and international dishes for their scrumptious Buffet. There will be a selection of over 80 dishes to try from Western to Eastern delights. The choice of over 25 decadent desserts is a sure standout which includes their awesome towering Orange Chocolate Fountain. Marriott Cafe will also be hosting a kaleidoscope of kids activities on Easter Sunday from balloon sculpting and ombre glitter tattoos to customization of key chains. 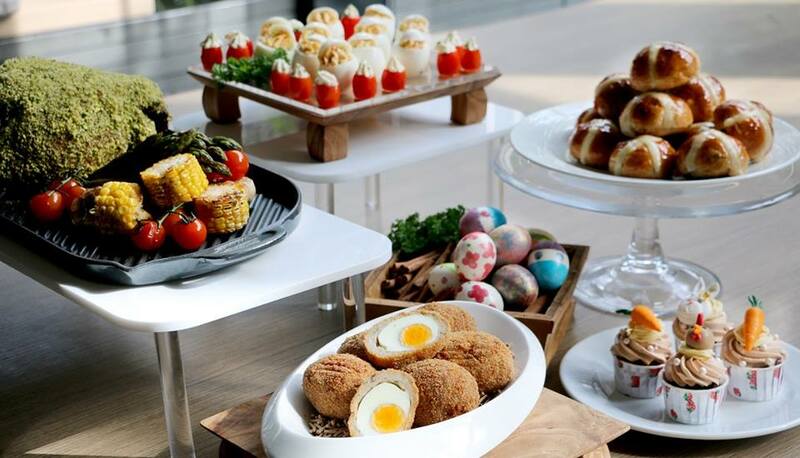 Here’s a little hint: If you want to host Easter at your home but have no cooking skills, you can order your Easter lunch from Marriott directly. Carousel at the Royal Plaza on Scotts is having blast from the past bonanza this Easter. 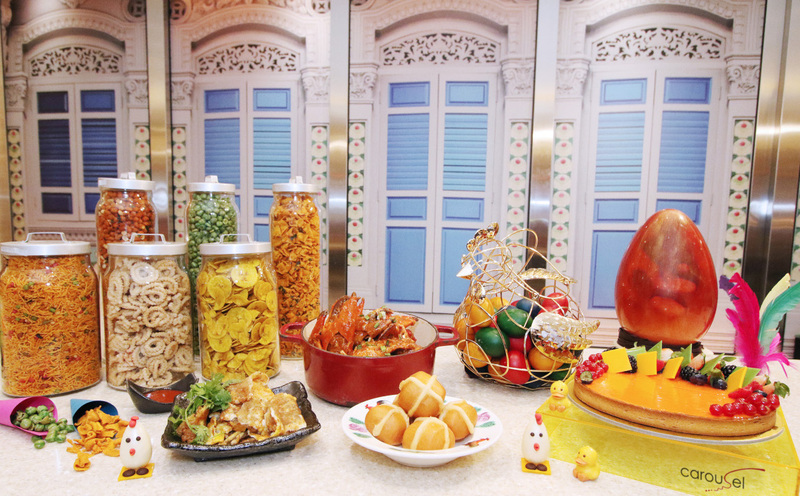 The theme is heritage and you’ll find all the of Singapore’s greatest hits with a hint of Easter like Chilli Crab served with Hot Cross Mantous. There will also be ding ding candy and old school treats like a kacang puteh cart available. While the parents dine to their hearts’ content, the kids will be given a map to go on an exclusive treasure hunt. But the prizes don’t only come with yummy chocolate eggs, each treat comes with a fun historical fact. There will also be a tikam tikam board, a traditional game of luck played back in the day. Prices: Adults: $68++; Children $43++ for children. The Fullerton has no shortage of restaurants that serve spectacular treats and come Easter, they will all be celebrating with an array of activities and delicious eats. There is the always festive annual Easter Egg Hunt which starts at the East Garden in The Fullerton Hotel, with other interactive activities like Easter Egg Decorating and Balloon Sculpting. There is also a dedicated Kids’ Room in both hotels. From chocolate eggs and bunnies and an Afternoon Tea with a performance by Harpistat The Courtyard to the Town Restaurant’s Sunday Champagne Brunch and the ‘Buona Pasqua’, a long-table feast at The Lighthouse Restaurant, there really is something for everyone. Hint: If you’re looking for a staycation, Fullerton is offering some amazing specials over the Easter weekend including a complimentary stay for up to two children below 12 years old. 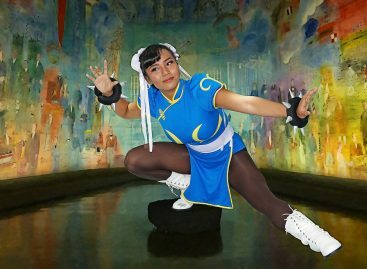 Prices: Prices vary from $55 to $142 per adult with alcohol. For more information, bookings and room rates click here. Known as one of the most authentic places for Thai food in Singapore, Blue Jasmine at the park Hotel is also celebrating Easter this year. Along with some delicious Thai food served buffet style there will also be a sprinkle of Easter creations like Scottish Egg (beef as the restaurant is Halal) and Potato Au Gratin. There are also child-friendly treats like Mixed Grilled Sausages and Chicken Sliders and the grand finale a three-tiered Chocolate Fondue. And to top it all off, there will definitely be an Easter Egg Hunt where the entire family can bond. Form more information and reservations click here. Keen to meet a luchador and bash a pinata this Easter? If your answer is si, then you should head over to Super Loco Robertson Quay for some authentically Mexican activities and food. The fun starts with an arts and crafts workshop where you will learn how to make creative gifts using recycled materials and non-toxic, paraben-free paint which is safe for children. 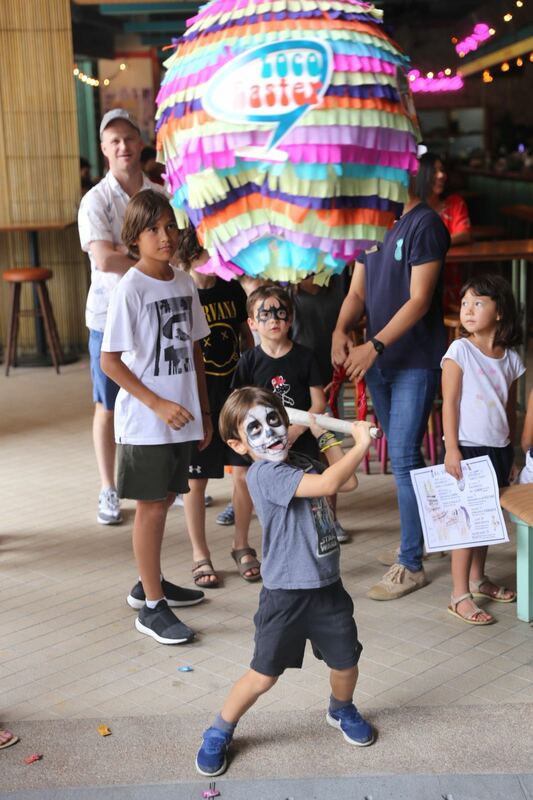 The festivoties continue with face-painting, swinging at the Easter-Egg piñata and meeting the friendly yet strong luchador. This all happens while enjoying some of the best Mexican food thatr Singapore has to offer. 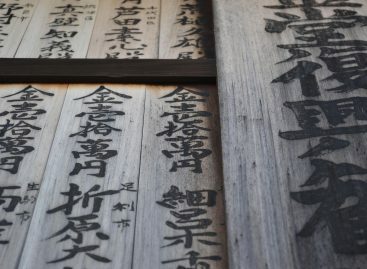 And the best part, admission is free and open to the public all day, but recommendations are highly recommended as they may reach capacity very soon. You can also bring the entire family including the little furry friends! Prices: No entrance fee, prices will vary depending on your order, see the menu here. See more information on their Facebook page or the website. Tired from running around all day, take a break at one of these all-inclusive and affordable resorts in Malaysia.